My life has been shaped by my experiences, some good, some not so good. These experiences are what has made me, and have been added to my emotional knowledge data bank. This store of memories I regularly revisit, a bit like having my own Google search brain on board, one of the many dyslexic skills I was gifted with. Being dyslexic also gives me an ability to reverse engineer problems along with quick thinking. Thoughts and ideas consume my brain most of the day. Storytelling helps us to understand concepts quickly and makes them more memorable. Our brains have 50,000 thoughts a day according to the National Science Foundation of America, 95% which are repeated. The quieter voices of society are not always heard. Learning to walk in other people shoes also teaches empathy and makes us better people. I qualified from DIT in 1977 with a Dip I.D. I worked in New York and London using my design skills Then returning to Ireland in the 1980s worked with Kilkenny Design for six years before starting my own practice Geraldine O’Brien Design (1986-2009). My experience at Kilkenny Design influenced my freelance work considerably both as a designer and educator. I have always sought variety in my interior/exhibition work and welcome the challenge and the opportunity for personal development. Projects have ranged from rehousing of Magdalen women to purpose built accommodation, refurbishment of a five storey Fitzwilliam Square Georgian house and mews, sheltered accommodation, nursing homes, general residential interiors and exhibitions for the craft industry. I was commissioned by The Crafts Council of Ireland to deliver a training programme to benefit emerging crafts people across the country and developed a format incorporating lectures, mentoring and provision of workshops between 1986-1998. Since 2009 I have been in practice with my husband in our firm McCarthy O’Brien Architects and Designers. MCOB in Dublin. We have two adult children in professional careers. What is fundamental to the way I work, whether designing an interior, an exhibition or a craft display, is listening to the client or craft maker, getting to know their style and their story so as to create a space and ambience that preserves their individuality and help them create something special. 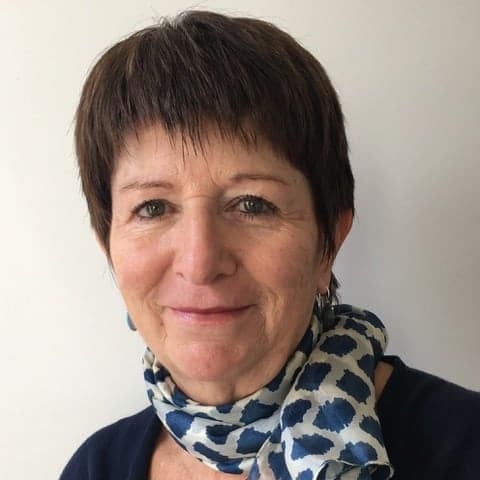 You can contact Geraldine by email or connect with her on LinkedIn. Our dogs need to be walked at least once on a daily basis. On one of these recent daily adventures into the unknown, Grizz our border terrier, came to a full stop at the fork in the road. Pulling or dragging the lead made absolutely no difference. I was impatient as I was in a hurry to get back home to do more important ‘things’. The Grizz enforced stop is what we now call his ‘stuck dog syndrome’ forced me to find a solution and as I bent down to lift him wriggling into my arms it struck me “Ah he wants to go to the beach”. One fork in the road was more concrete and similar to more ‘lead of torture’ he remembered from previous walks and the other was much more inviting as it led to the beach, soft sand and no lead and oh so much more interesting smells. I empathised with him and I gave in. Enjoying and seeing him revelling in his excitement in his new found freedom, made me ponder. How could I give him that enjoyment more regularly? It was a beautiful day anyway and so off we went to the beach and I joined him pulling off my shoes allowing myself to follow in the soft sand of his paw tracks. I recalled the endless pacing of Spunky, Dublin Zoo’s famous female polar bear who was constantly depressed and I wondered was I responsible for making our dogs lives miserable as I was the one who ruled their lives and decided when they got their dinner and walks. They had to be endlessly patient. I felt horrible and until now never realised I was their jailor in effect. “Wouldn’t it be good if we had robots for dog walking ? You could programme his favorite routes and other fun activities. Robots are more patient than humans, won’t mind the wet etc”. I soon realised it would take some time before that would happen and finding a patient fun dog walker was a better option for now. I still like that idea and have hung on to it just in case. Fast forward a couple of years we have now been joined by Grizz’s twin sister Meg. They are both very cute and clever in their own ways. I find it fascinating to see how they have different forms of intelligence a bit like observing the differences between my son and my daughter. Grizz is much much bigger than Meg, He is much softer and gentler but still can’t open doors like she can. Meg on the other hand spent her early years on a farm and as the baby of the litter had to fight for her place. Grizz should be the Alpha Dog but it’s little Meg who calls the shots. Our recent walks to the park have been unusually peppered by “stuck dog syndrome” so finding an empathic way to stop it was on my mind, recalling my idea of robot walkers. Just as I went to let them off the ‘lead of torture’ I spied another dog in close proximity and had learned by now that this might not be such a good idea. Grizz and Meg had told me on many previous occasions they did not like boxers. “That big fellow bit me when I was a puppy” Grizz. “He scares me and sniffs me without asking my permission” Meg. My daughter taught me ‘dog speak’ when she was young. She now walks in her customers shoes as she is a vet. I decided to go the other way around the park and so as not to meet the boxer full on and hopefully have a less stressful walk for all of us, I released them. Off they danced delighted to be free, both in different directions. Grizz was more leisurely and Meg hared off into the undergrowth, I followed her as she is the more unpredictable. Thankfully Grizz followed me and when the initial excitement calmed I saw happy excited dogs and resolved to try and make their walks more exciting in future. I was beginning to feel good about myself as we walked home. Then passing a building site a builder dropped a very noisy metal canister on the road which turned them into two very quaking dogs straining on the ‘lead of torture’ desperately trying to run away into what was the path of a fast oncoming car. Thankfully I was able to hang on to them. The disgruntled car owner drove away shaking his head. It took a little while for all of us to calm down including the driver. Aware of all the sounds around us – cars, lorries, jackhammers, drilling, screeching, door slamming, etc. it was no wonder we all were trembling. It took a while to reach home as they ran away from all manner of distractions, passing runners, baby buggies and other dogs. I felt sorry for them. Could this be a possible form of posttraumatic stress disorder developing ? For weeks afterwards there was lots of ‘stuck dog syndrome. We now vary our routes to the park on a daily basis to help their PTSD. We are learning to understand what they are thinking and so better able to give them a better life. I like to try and tune in to my Grizz and Meg as I am their human robot for now. 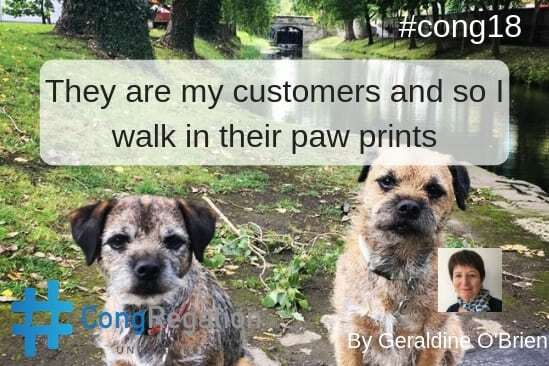 They are my customers and so I walk in their paw prints. Lessons to self for everyday negotiated living and survival. Our human lives are not too dissimilar to Grizz and Megs. We are all trying to negotiate the ups and downs of our daily lives, finding new ways and ideas to make our paths easier. I am a daily disrupter of anything that in my opinion is broken. Size doesn’t matter I’ll give it a go with my busy mind.I am mindful that the development of ideas often are not fully worked out can be harmful or user unfriendly. For me ideas come from knowledge and understanding and being open to how ‘the idea’ will be used. I discovered my own “I have a dream” idea to give anyone a simple way to tell their life story. LifeStor is about building a Digital Story Archive. It is not an easy project to develop and is teaching me the virtue of patience. As part of the learning curve, I pursued a HDip. in Entrepreneurship in AIT in 2014. Our lives are not too dissimilar to Grizz and Megs, we are all trying to negotiate our daily lives finding new ways and ideas to make our paths easier. Dogs helping us humans with tasks is not far off. Perhaps robots for dog walking may become a possibility. I know some very clever dogs that would be happy to test it. However, whether footprints or paw prints, walking in them builds relationships.